Sakari Oramo was chief conductor of the Royal Stockholm Philharmonic from 2008 until mid-2013. At that point he took charge of the BBC Symphony Orchestra although he conducted only two concerts in the 2013 season. Thus this recording is something of a farewell issue, the Nielsen 5th having been made in June 2013. 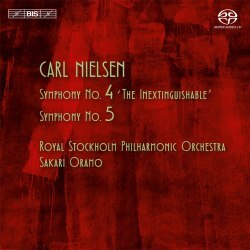 Nielsen has been a feature of Oramo’s first full season, and he is now two-thirds of the way through a cycle of the symphonies, with the 5th to follow in April 2014, and the 6th, Sinfonia Semplice, in May. So this issue is of particular relevance to British music-lovers at present, and not having made it to any of the concerts yet, I was interested to hear these readings. My verdict? Get tickets and get along to the remaining two events if you possibly can – these are thrilling performances. From the very beginning of the Inextinguishable, you feel you are in for something very special. The energy Oramo pumps into the opening of this great work is tremendous, and sets up a momentum which he sustains throughout the work. He builds powerfully to the first big climax at the end of the 1st movement’s exposition. Equally impressive is the sudden hush, with those strange little mutterings in oboe and horn. The recording by the BIS engineers is exceptional, capturing all the detail with utmost clarity, allowing for titanic tuttis as well as magical pianissimi. In the short poco allegretto, Oramo draws playing of great piquancy and humour from the Stockholm woodwind, reminding us how important this composer was for Shostakovich and others later in the 20th century. When it comes to the famous pitched battle of the timpani in the finale, it is achieved with frightening impact and clarity – exactly what Nielsen had in mind. Throughout this amazing work, the orchestral playing is of the very highest class, from all sections. I was a little taken aback by the brisk start of the 5th; checking the score, I found that it is marked crotchet = 100. Oramo starts around 120, very much faster than marked by Nielsen. Once more, the playing is superb, and the quick tempo does provide palpable urgency. What you lose is that sense of despondency, of lack of purpose that is the context for the evil forces that invade the music, personified most obviously by the side-drum. So there is a slight reservation here but it doesn’t go too far. I admit to being swept away by, again, the momentum developed by Oramo. When the great G major music begins, Oramo asks for, and gets, expansiveness and grandeur from his players, which creates the sharpest contrast with the spikiness and aggression of the preceding music. This movement is heading towards another pitched battle, even more terrifying and memorable than that in the Inextinguishable. The orchestra’s side-drummer launches a truly violent assault; and it provoked an interesting question: what is it that Nielsen saw as the greatest threat to our civilisation? Was it military action? Or was it perhaps the equally mindless, ugly and seemingly unstoppable march of trans-Atlantic popular music? Possibly both. The great struggle, in which the noble melody eventually emerges victorious, is fully as compelling as it should be. One small disappointment: after its defeat (temporary) though, the side-drum should surely be more clearly distant and off-stage; here, it is all too audible, nearly as seemingly close as during the earlier part of the movement, and the clarinet solo suffers a little as a result. Oramo sweeps us on into the confident swagger of the opening of the second movement; there are only two in this symphony, though each falls into a number of clearly defined sections. However, that confidence proves brittle and short-lived, and Nielsen only finds his way back to it after many set-backs. Through all of these, the orchestra is magnificent; the string parts in this movement are notorious, and there are any number of elephant traps for the unwary. That said, Oramo’s grip on the music never fails, and he sees the symphony through to its hard-earned conclusion. These are central works in the canon of the 20th century symphony, and these recordings are a truly significant contribution to their performance history.